In the last blog article we looked at the Wayfarers faction Tactica, closely discussing the first two models of the faction boxed set. Now, to celebrate the opening of the Drowned Earth Kickstarter Pledge Manager and Pre-Order store, we will now look at the rest of the faction, as well as the first ever glimpse of our newest addition, Grayze! As we saw last time, the Wayfarers can be used either as a single faction, or as mercenary additions to existing factions. This gives access to different tactical options and list building strategies which will help you win games, although perhaps not friends! No no, seriously, we hope you all play with a friendly frame of mind, and remember that games should be fun both for you and your opponent! Lets get started though, and take a look at Grayze, the faction Medic and dedicated distractor! 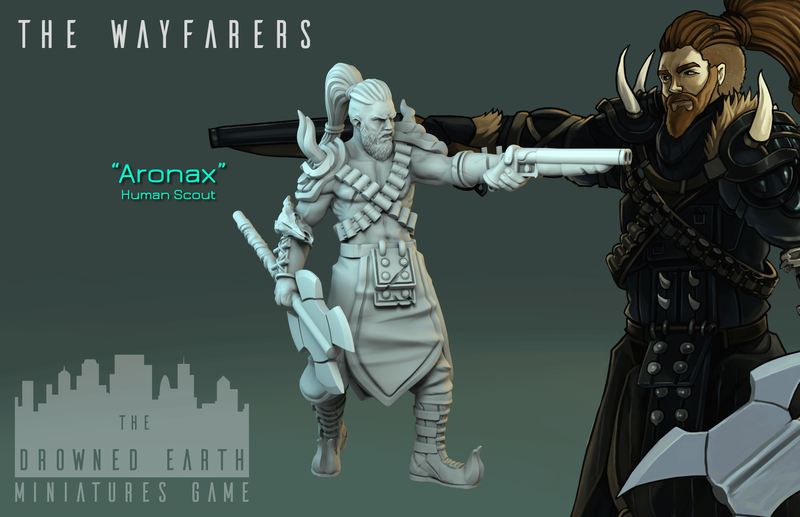 The Wayfarers Faction scout, Aronax is a dinosaur hunter by trade, who specialises in ambushing his enemy at close range. Armed with a sawn-off shotgun, he is not the best shot in the world, but it would be a mistake to try to use him at range. This is especially true as he is a Stealth model, meaning he can deploy in Stealth mode, and surprise an unweary enemy before they have the chance to react! However, he also has the Ambush skill, meaning that he can react with a Charge action against any model within 4″ of him- an excellent skill for board control, especially in tandem with Stealth! The combination of these two skills makes Aronax a problem the enemy really needs to deal with, particularly in objective grabbing scenarios like Treasure Hunt and Attack and Defend. He lacks the (outstanding) re-stealth ability, meaning one has to pick the perfect moment to use him to best advantage, but taking in to consideration he is a Scout, and thus has the ability to deploy using the special scenario “Infiltrate” rules, Aronax’s Ambush capability is extremely dangerous! He is of average resilience meaning that he will need to be careful of any serious ranged threats, and as his shotgun is low range it’s best to keep him out of long ranged firefights in any case. Not the most versatile model in the Wayfarers, but one who certainly excels in his chosen niche. A Scout has the ability to deploy up the board, and so that combined with very strong close range skills and stealth is deadly indeed. He seems a natural match for the Bondsmen who lack any stealthed models, and have no access to Ambush either. However, It’s easy to find Aronax a home in any faction, particularly when playing a defensive game or trying to defend on one wing of the battlefield. Speaking of deadly Kalhana is not a subtle model in any way, shape or form! One of the most expensive models in the range, let alone the Wayfarers Faction, Kalhana has a devastating combination of excellent range, high ranged damage and more wounds than anyone else in the game! Armed with a self rigged Light Machine Gun (because as you might imagine, human manufactured weapons are not ideally suited to manipulation by large elephantine hands!) and a punch dagger made from his own tusks, Kalhana is a rage machine waiting to happen! An average marksmanship skill is augmented by the excellent “gun rage” skill, adding +1 for each time earlier in the activation the model has shot, Kalhana gets more accurate the more bullets he sprays each turn, which is probably how one imagines a one ton Vickers Toting maniac to behave! Gun range can be explained by the battle rage Musth state he gets in, as adrenaline and aggression hormones send him in to a rage. In close combat too he has Berserk, meaning that if wounded he can move faster, and hit harder, as he tries to track down whoever hurt him or, frankly, anyone else in his way! On the down side Kaulhana is too bulky and muscular to be particularly agile or speedy. While the other “Tough” models all have a mobility skill Kalhana lacks such an extra skill, although his high intelligence means he is better than most at spotting stealthed models. If one can get him to a suitable vantage point Kaulhana can really dominate. The Gun Rage skill in combination with a long range weapon brings a huge threat vector to the table, and even if your opponent is clever enough to ensure he doesn’t get to use it that often, his sheer presence is directing the flow of the battle, and that’s something you can take advantage of. Kalhana is a natural fit for the Militia, who are most similar to him in terms of play style. However, the idea of having a elephant shaped gun turret harassing the enemy as the relatively squishy Wayfarers achieve their game goals seems very strong also. Since she was a little girl Grayze was looking for more than the world she knew, growing up in a little rural village, behind safe palisade walls. She snuck out and explored the ruins, dreaming of adventure and discovery, and pondering the strange objects she found there. Grayze grew up in body, but never allowed the real world to break the magic of her imagination. She found an old digital archive of comic books, fascinated and inspired by the stories they told, Grayze vowed to emulate the super-hero idols contained therein! player, it’s easy to overlook her uses. However, she is fast, agile and, due to the Camoflage skill, hard to hit at range. One can imagine her cartwheeling all over the battlefield, dodging enemy fire and accurately placing smoke bombs in strategic positions to cover an advance, run interference in front of long range threats, and protect her fellows. She is proficient in Close Combat, stunning her enemy (removing Action Points) each time she successfully hits, with the ability to dodge out of combat afterwards! One should not underestimate the use of Smoke- rendering shots travelling through it at -2 marksmanship, and stacking with other forms of cover, it does not stop shooting completely, but it significantly reduces its effectiveness. Grayze can assist the Bondsmen in advancing in to the sorts of range where they excel, negating the advantage of longer range factions like the Militia and Artifacters. Likewise she provides any faction with an agile and fast moving objective grabber, one who is both hard to hit, and able to lay down cover on order. In all, while her damage output is very low, Grayze is the kind of character that can win you the game in a tight spot, and help you control the course of a skirmish. All of this at a very reasonable cost, and on top of all that, she’s a decent Medic for the Wayfarers Faction too! We hope you’ve enjoyed this second glimpse in to the Wayfarer models and the potential they have as a faction in their own right, as well as individual picks for other factions.